British Society of Criminology’s Code of Ethics for Researchers in the Field of Criminology. (2006). http://www.britsoccrim.org/docs/CodeofEthics.pdf. Accessed 7 Oct 2014. Economic and Social Research Council (2012). Framework for research ethics. Swindon. http://www.esrc.ac.uk/_images/framework-for-research-ethics-09-12_tcm8-4586.pdf. Accessed 23 Sept 2014. Grinyer, A. (2005). Personal agendas in emotionally demanding research, Social Research Update. http://www.soc.surrey.ac.uk/sru/SRU46.html. Accessed 7 Oct 2014. Hammersley, M. (2014). On ethical principles for social research, International journal of social research methodology, http://dx.doi.org/10.1080/13645579.2014.924169. Accessed 7 Oct 2014. Matthews, R. (2014). 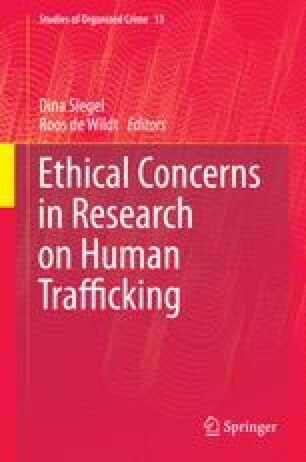 Female prostitution and victimisation: A realist analysis, International review of victimology. http://irv.sagepub.com/content/early/2014/09/02/0269758014547994. Accessed 7 Oct 2014. Scott, S. (1998). Here be dragons: Researching the unbelievable, hearing the unthinkable: A feminist sociologist in uncharted territory. Sociological research online, http://www.socresonline.org.uk/3/3/1.html. Accessed 19 Aug 2015. University of Brighton. (undated). Illegal activities: Implications for researchers. http://about.brighton.ac.uk/hss/fregc/Illegal-activities.pdf. Accessed 26 Sept 2014.